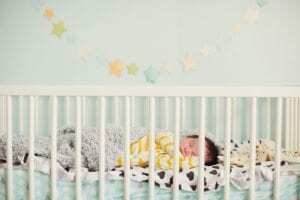 Buying a baby crib is one of the most necessary purchases new parents make for the nursery. The options new parents must consider are based on a variety of factors including safety, types and cost. When new parents begin to pick and choose the kind of baby furniture they want for their little one, there are many options. With a comprehensive guide, new parents can make proper decisions for their future child. There are distinct differences between the many kinds of beds and cribs available for newborns. These differences are based on the baby’s needs, the parent’s lifestyle and, of course, the parent’s price frame they wish to stay within. 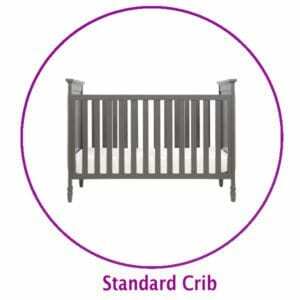 The most traditional option when it comes to cribs are the standard choice. These are typically cribs with a hinged side to make lifting baby in and out of bed easier. (Note: These are not to be confused with drop-side cribs, which have been recalled and banned from the U.S. Consumer Product Safety Commission [CPSC].) The standard crib generally takes up less space than other options such as a convertible crib and some styles come with various features such as wheels for easy relocation or teething rails. 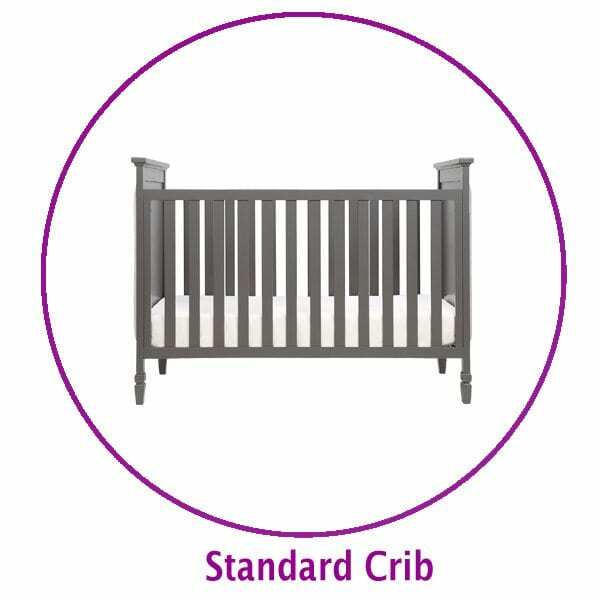 The standard crib is a basic beginner option for babies and typically run lower in costs. Becoming the most common type of baby sleeping sets, these average models of baby furniture typically display a complete wood finish and more aesthetic decorations. The convertible models of cribs are useful as the baby grows up to an infant, a toddler and a young child, as the bed can be modified to fit the growing child’s needs by converting into one or more different types of sleeping furniture. 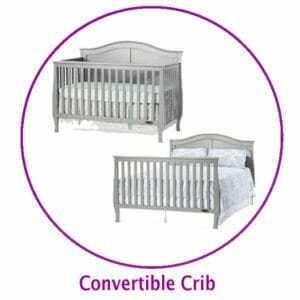 Convertible sets are useful when it comes to making a transition from infant to a young child since there typically are no additional pieces are necessary to complete it, however, some sets may require a conversion kit to be purchased to transform the crib into a single or twin-size bed. 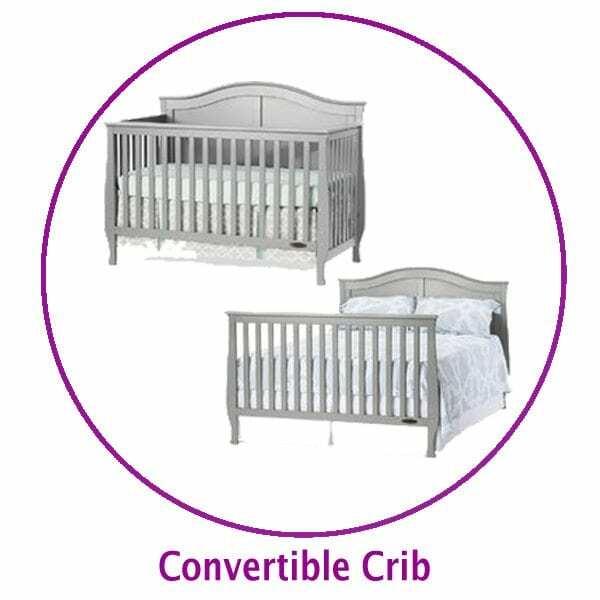 When it comes to styles of convertible cribs there are 3-in-1 and 4-in-1 types available. Typical arrangements include removing the front rail of the crib and replacing it with either a straight rail or a toddler safety rail and further removing the safety rail for expanding the bed into a twin or full-size bed by using the back of the crib as the headboard and the front as the footboard. This style of crib is the most cost-effective option as one initial higher price covers the sleeping arrangements for your child for years. Just as the name suggests, these types of cribs are the perfect choice for parents looking to change their baby’s sleeping locations from time to time with minimal inconvenience or for saving space in close quarters. 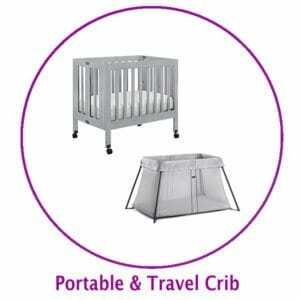 These portable crib options easily folding flat and come on wheels, allowing you to move the crib by simply pushing it. Once the crib is relocated to the desired location, simply use the locks on each wheel to lock it into place for easy roll-away storage, for a different setup location, or for having sleeping arrangements for baby when traveling. When looking into these options, take your flooring into account when looking at the various wheels available. Wheels that glide effortlessly over carpet may scratch and damage wooden floors and vice versa. 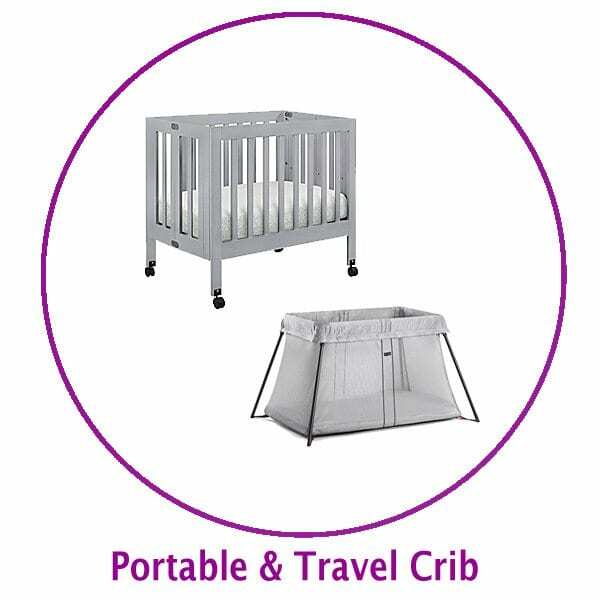 For parents looking to do more traveling, a travel crib may be the way to go as these are made from lightweight materials that can fold down into smaller sizes for easy carrying and transportation. 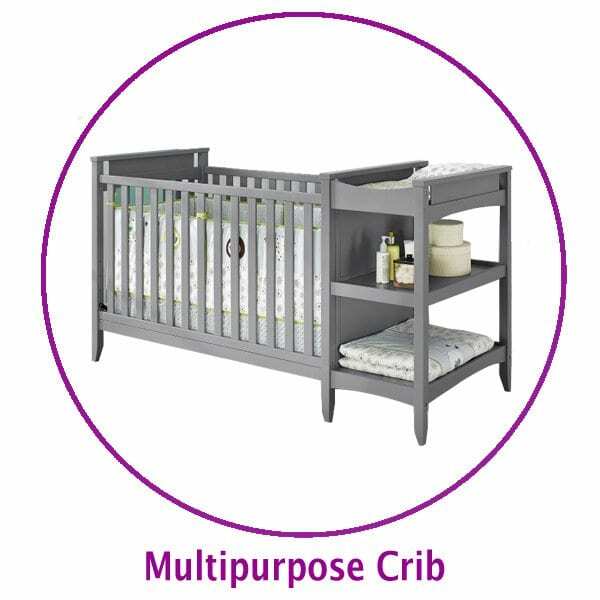 These cribs tend to combine a standard crib style with one or more other pieces of furniture such as a changing table or dresser. The appeal of multipurpose baby cribs is that the cost includes buying the two or three pieces of furniture together rather than separately. These options are a good option for eliminating the need for extra furniture. However, they may be larger in size than a regular crib and may not include as many features as other stand-alone crib options. While many new parents use a crib from the start, a bassinet or co-sleeper has some benefits from the start. These smaller options are great for moms still recovering from delivery or for moms who have limited mobility as they can make middle-of-the-night nursing sessions more manageable as mom can reach over to pick up the baby without leaving her bed. For new parents looking to attach their baby’s sleeping arrangements to their bed for close monitoring, a co-sleeper may be the best option to allow close proximity without the worry of harming the baby when asleep. 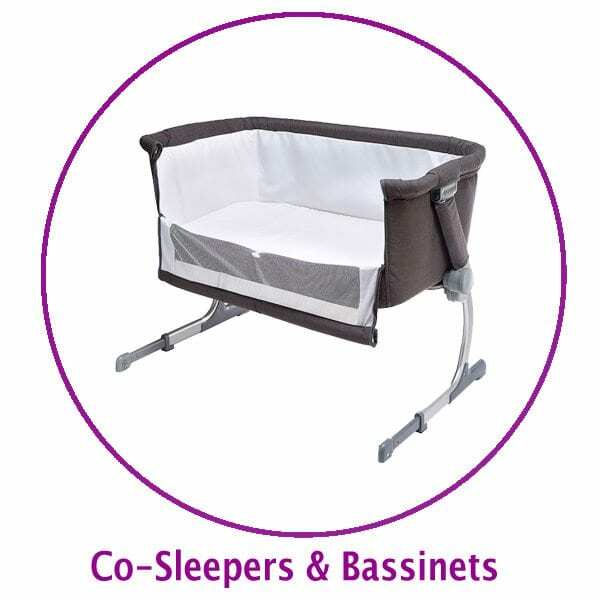 While there are different types of co-sleepers available, depending on what kind of co-sleeping is desired, the most common form is a bassinet or crib that attaches to the side of the parent’s bed. There are also convertible co-sleeper options that transform from attached co-sleeper crib into a permanent stand-alone crib later on. Cribs come in all different shapes and sizes and cater toward all ages of baby, toddler and child. Some cribs will come with the ability to raise or lower the height of the mattress. In the early stages of your baby’s life, raising the mattress height allows for easy access to baby. As your baby learns to sit up or use his or her hands to stand up, the mattress may be lowered to help prevent your active baby from climbing or falling out of the crib. 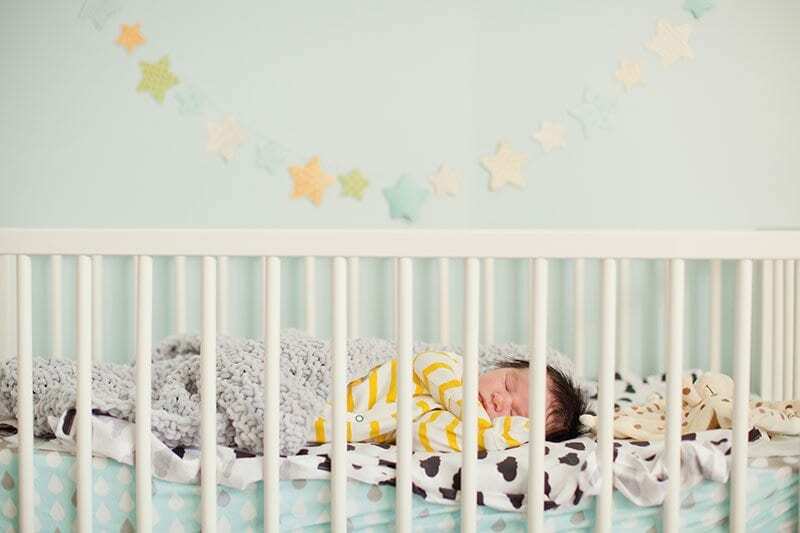 While many cribs cater to your growing baby, bassinets and side sleepers are typically only used during the newborn stage until the baby is able to move around, push up on their hands or roll over on their own, usually between three to five months old. As the last step in considering buying a baby crib, new parents must make a decision based on purchase price. The crib alone, not including the mattress, typically costs anywhere from $100 to $2000, and a crib mattress can cost from around $50 up to nearly $400 for organic ones. Like everything else, it all depends on how fancy you want to go and what features you are willing to compromise on and which ones are necessities for your lifestyle. As new parents prepare for the new journey of parenthood, safety is the first necessary step. Although new parents may have recommendations key sleeping features or design, they need to be aware of several safety features. – Avoid the drop-down barrier often seen in older models. Cribs with drop down sides can often turn up at yard sales for what seems like a great price, while it may seem like a great deal and a nice feature, for your baby’s safety it’s best that you walk away. – Purchase bed sheets according to the mattress dimensions for a tight fit. – Avoid placing snuggly stuffed animals, bed bumpers and blankets to prevent suffocation. – Before purchasing a used baby crib, always check the CPSC Recall List. Whenever a baby crib recall occurs, whatever the product, it will appear on this list. When it comes to buying a crib, don’t forget the mattress. It’s best to buy a mattress at the same time that you purchase the crib to ensure that the mattress fits snuggly into the base of the crib. The standard rule is that if you can fit two fingers between the mattress and the end of the crib, your mattress is too small. Even the use of a thick crib sheet will not be enough to fill out the gap and it may lead to baby injury. All babies go through the teething stage. When it comes to this stage of life, a baby will try to get their mouth on anything and everything; this includes their crib rails. To ensure your baby can teeth safely when chomping on their crib, be sure to get a crib that has a teething rail feature or allows for the use of a teething rail to be added later on. These rails are typically clear, non-toxic plastic that fits over the top crib rail. This will ensure that your baby’s gums are protected and will keep your little one from having paint or wood particles as a snack. Another name for wheels, these swiveling wheels are attached to the bottom of the crib legs, allowing the option for easy movement of the crib. These come in handy when it comes to cleaning under the crib or moving the baby from room-to-room. Cribs can come with two or four casters, but at least two must be lockable when not in use. A little extra storage always helps. To keep a change of lines or extra onesies easily accessible when needed, look for a bottom crib storage drawer to make things just a little easier. These cushioned pads attach to the inside railings of the crib and while there are not as common, sometimes can be found included in crib bedding sets. While these may seem like a good option for safety, a number of organizations, including the AAP, discourage them as a SIDS hazard for babies.